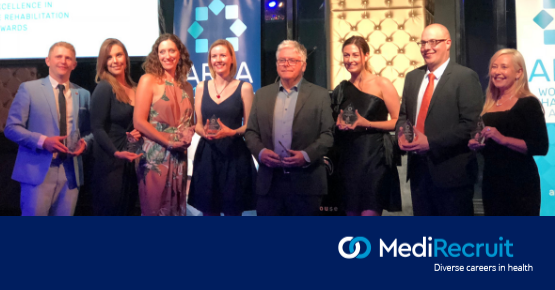 Medirecruit’s Directors Clare Jones and Danielle Weedon proudly presented the Award alongside ARPA’s President Shaun Lane at the 2018 ARPA Conference in Sydney. Chris has worked in the industry since 1986 and his passion for empowering individuals through effective rehabilitation shone throughout his acceptance speech which can be read here. “Throughout the Awards evening, it was humbling to be surrounded by the State and Territory ARPA Award Winners, each of which, have made a unique and significant impact on individual lives as well as Australia’s broader workplace health,” said Danielle Weedon. MediRecruit proudly supports the Australian Rehabilitation Providers Association Awards. Directors’ Clare Occupational Therapist, and Danielle Physiotherapist, personally understand the unique challenges of working in the industry and are committed to acknowledging the dedicated individuals, like Chris, for their vital contribution to workplace rehabilitation in Australia.